On March 1, 1999, Bertrand Piccard and Brian Jones lifted off from the Swiss alpine village of Chateau d'Oex in the Breitling Orbiter 3 balloon. On March 21, 1999–19 days, 21 hours, and 55 minutes later–they landed in the Egyptian desert after traveling 45,755 kilometers (28,431 miles) and completing the first nonstop flight around the world in a balloon. The success of Breitling Orbiter 3 was built upon two previous attempts: Breitling Orbiter in 1997 and Breitling Orbiter 2 in 1998. Those experiences enabled the Breitling team to develop trustworthy technical systems and a basic strategy in which Piccard and Jones would pilot their balloon up to altitudes of 11,000 meters (36,000 feet) and to where jet stream winds would drive it at speeds up to 176 kilometers (105 miles) per hour. 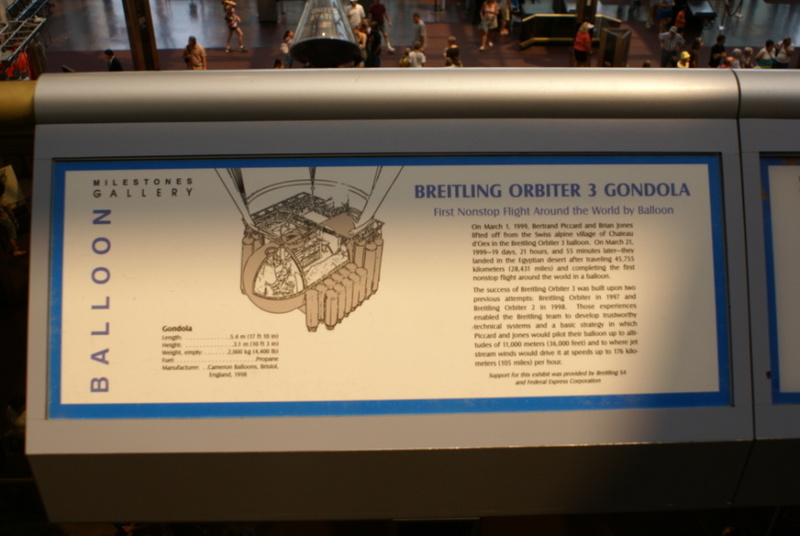 The Breitling Orbiter 3 gondola is NASM catalog #A19990257000.